The translated meaning of Salamba Sarvangasana is “whole body pose”. It is often prefaced by Salamba, meaning supported. Your hands support your spine. Your upper arms and shoulders form the bedrock of the pose. For many years I couldn’t grasp how to get my whole body involved in shoulderstand. The ideal shape of the pose appeared like a shimmering but distant mirage to me. I would struggle to get upright. The effort exhausted me. My kidneys would start to ache. I’d have to give up after being in the pose for more than several minutes. Maybe I have masochistic tendencies, but I hung in there. I’m talking decades. I would try various props and set-ups. I’d go to a workshop and get a brand new approach. But not much seemed to help. The importance of Salamba Sarvangasana cannot be over-emphasised. It is one of the greatest boons to be conferred on mankind by our ancient sages…. 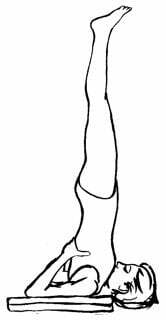 If a person regularly practises Salmaba Sarvangasana. New life will flow into him; his mind will be at peace and he will feel the joy of life. I can now say that I am pretty sold on shoulderstand as a pose that balances energy. It peps you up if you are flagging and chills you out if you’re overstimulated. And, there are many other benefits. I find Salamba Sarvangasana has a wonderful way of removing shoulder tension. When I miss out on doing practice for some time, my neck seems to suffer. I’m sure that the neck flexion in the pose and weight-bearing on the cervical vertebrae have a salubrious effect. I had to learn so much about Salamba Sarvangasana to finally befriend the pose, So, I have a toolbox of props I can suggest to my students. I’ve also learned optimum ways of using my body in the pose. I now balance my weight on my outer shoulders by using the strength and length of my triceps. I can get more lift in the pose by using middle buttock muscles and outer hips. Here’s one variation for students who have trouble lifting up in the pose. It’s one that is described in Donald Moyer’s excellent book, Awakening the Inner Body. It’s said that inverted postures are the family of poses that are youth-ifying. If that’s true I count myself fortunate that I learned the pose before I became old.